A Manitoba hog producer says he is keenly aware of the fact that his normally friendly animals are capable of killing him. Ian Smith, who runs the Natural Raised Pork farm near Argyle, Man., was reacting on Tuesday to reports that a farmer in the United States may have been eaten by his own hogs. 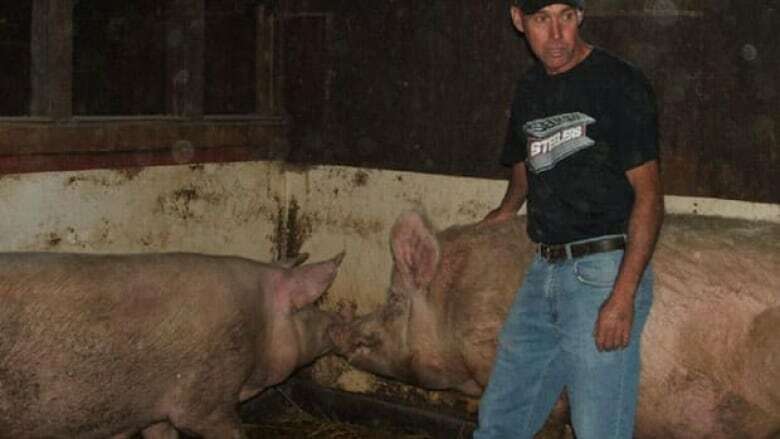 Terry Vance Garner, 69, a hog producer in Coos County, Oregon, went out to feed his pigs last Wednesday and never returned. A family member who went searching for Garner discovered his dentures and pieces of his body in the hog enclosure several hours later, but most of his remains had been consumed, according to the Coos County district attorney. Several of the hogs weighed 317 kilograms or more. Smith, who has raised hogs since 1993, said he was not surprised to hear of what happened to Garner. "I myself know if I ever … had a heart attack or passed out among these pigs … they are just playing with you at first," he said in an interview on CBC Radio's Up to Speed program. "But once they drew blood from you, you would be like shark bait, sorry to say," he added. "It's the taste of blood that's the trigger." Smith said he became used to his hogs nipping at him in the pens a long time ago, but he added that they are not normally aggressive animals. "They're just being playful. They're nippers, very inquisitive … they aren't out to hurt you. You just have to pay them the right amount of respect," he said, adding that there is some degree of danger associated with any farm animal. Oregon police are pursuing the theory that Garner, 69, may have collapsed in the pen and then was eaten by the hogs. Police say they are also investigating the possibility that Garner may have been the victim of foul play.